The Cassini Titan Radar Mapper obtaines Synthetic Aperture Radar images of Titan's surface which show that Titan's surface is very complex geologically, showing evidence of major planetary geologic processes, including cryovolcanism. The paper below discusses the variety of cryovolcanic features first identified from SAR images, their possible origin, and their geologic context. The features which we identify as cryovolcanic in origin include a large (180 km diameter) volcanic construct ( dome or shield), several extensive flows, and three calderas which appear to be the source of flows. The composition of the cryomagma on Titan is still unknown, but constraints on rheological properties can be estimated using flow thickness. Rheological properties of one flow were estimated and appear inconsistent with ammonia-water slurries, and possibly more consistent with ammonia-water-methanol slurries. The extent of cryovolcanism on Titan is still not known, as only a small fraction of the surface has been imaged at sufficient resolution. Energetic considerations suggest that cryovolcanism may have been a dominant process in the resurfacing of Titan. Lopes, R.M.C., K.L. Mitchell, E.R. Stofan, J.I. Lunine, R. Lorenz, F. Paganelli, R.L. Kirk, C.A. Wood, S.D. Wall, L.E. Robshaw, A.D. Fortes, C.D. Neish, J. Radebaugh, E. Reffet, S.J. Ostro, C. Elachi, M.D. Allison, Y. Anderson, R. Boehmer, G. Boubin, P. Callahan, P. Encrenaz, E. Flamini, G. Francescetti, Y. Gim, G. Hamilton, S. Hensley, M.A. Janssen, W.T.K. Johnson, K. Kelleher, D.O. Muhleman, G. Ori, R. Orosei, G. Picardi, F. Posa, L.E. Roth, R. Seu, S. Shaffer, L.A. Soderblom, B. Stiles, S. Vetrella, R.D. West, L. Wye, and H.A. Zebker, 2007: Cryovolcanic features on Titan's surface as revealed by the Cassini Titan Radar Mapper. 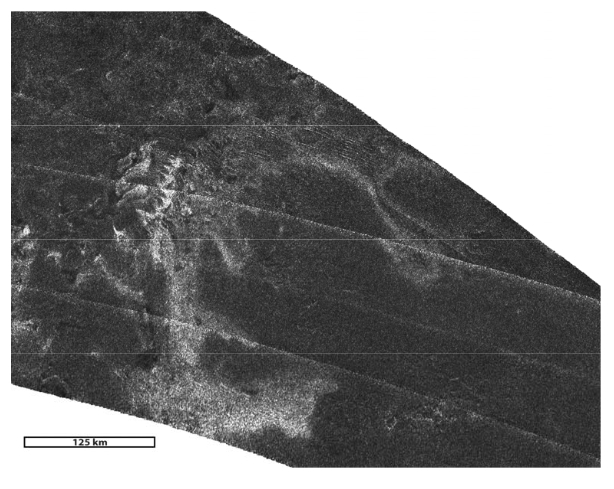 Icarus, 186, 395-412, doi:10.1016/j.icarus.2006.09.006. Many more scholarly articles about Titan volcanism can be found here!